So named for the corpses—or bits of corpses—often hung from its parapets, Traitor’s Gate serves as a grizzly reminder of Duke Nenonen’s absolute authority over his kingdom. Those with nefarious intent—particular smugglers and thieves—prefer to enter the city elsewhere. Most people who enter Languard on foot do so through Traitor’s Gate. Here the Great South Road linking the city to the Duchy proper merges with the hustle and bustle of the Low Market (itself a tangled confusion of stalls, pedestrians, wagons and roving pedlars). Two towers and a stoutly reinforced gatehouse comprise Traitor’s Gate. The towers—each fifty-foot high—provide excellent views over the surrounding area and are always manned by vigilant watchers. 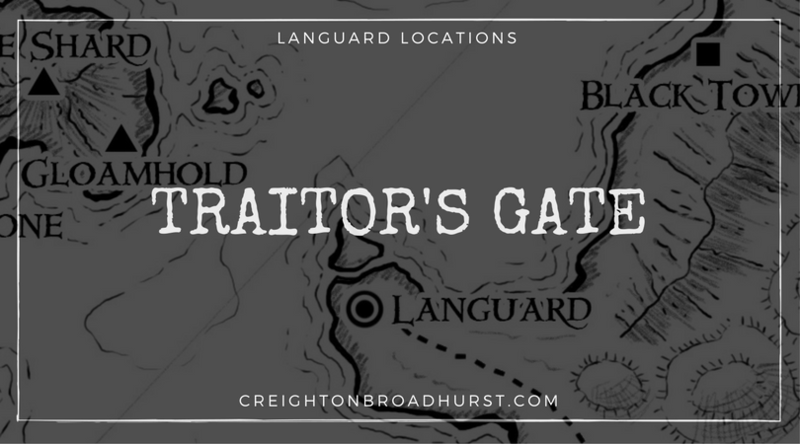 Traitor’s Gate is the busiest of Languard’s gates and thus is the most heavily guarded. The guards here let the vast majority of visitors pass unmolested, once they have paid the so-called Gate Tax. Suspicious or aggressive individuals, however, face greater scrutiny and perhaps even an interview with the Sergeant of the Watch before being permitted entry. Beggars and street urchins cluster just beyond Traitor’s Gate hoping for a coin from generous travellers or to—perhaps—secure work as a guide. Irja (CN young human female thief 1): Grubby and skinny, Irja lingers at their gate in hope of securing work as a guide. She works for the Shadow Masks and marks those who might be worth mugging or robbing. Trapped in her life through a combination of poverty and misplaced loyalty to her handler she wants to flee Languard to start a new life. Onni Markku (LN middle-aged human male fighter 2): A jobsworth who delights in following the letter of the law—the more obscure law the law the better—Onni revels in the power he has over those trying to enter the city. Onni has risen to the rank of Sergeant-at-Arms not because of his social skills—in truth he is lacking in this department—but through his almost unrivalled skill in raising taxes. Even entering the city can bring its own challenges or opportunities. The Sergeant of the Watch takes a dislike to one of the PCs and subjects them to a rigorous search and interview. He has a good memory, and bedevils the PC whenever they encounter one another. The Sergeant could be in the employ of some sinister master or could just enjoy bringing adventurers down a peg or two. One of the urchins working the gate is in the employ of the Shadow Masks. He tries to manoeuvre the PCs to a Shadow Mask haunt where they can be thoroughly robber.